A Slice of Smith Life: Unplanned DVD Review and Giveaway! I am blessed to be a part of the Unplanned DVD Blog Tour through Tyndale House Publishers. 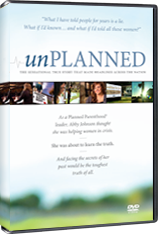 I have read Abby Johnson's book prior to receiving a review copy of the Unplanned DVD and I am a fan of Abby's Facebook pages HERE and HERE. Johnson's amazing story had me turning the pages quickly as she so eloquently told of her experiences as a former Planned Parenthood clinic director, and what caused her to leave Planned Parenthood, the largest abortion corporation in the nation. I was excited to hear that the Unplanned DVD was made since I enjoyed Johnson's book so much. I wanted to watch the DVD to learn even more about Planned Parenthood, and about Abby and her incredible journey. I also wanted my husband to learn about Abby's story. I knew it was most likely he would watch the DVD with me vs. read the book. I am so blessed to have this opportunity to share with you some of my thoughts about the Unplanned DVD. Here's a brief trailer to give you an idea of what this documentary is about. So, my husband and I had a date night last week, the movie of choice was the Unplanned DVD. Since I already read the book I was very familiar with her story, but my husband only knew what I had told him as I was reading. I highly recommend reading the book also since the 60 minute DVD was not able to include every detail of Abby's story, although it was still very comprehensive. The DVD also had details that weren't in the book. So together they compliment each other nicely to fully understand Abby's journey. My husband enjoyed hearing Abby's amazing story very much. His exact words were, "Wow, that was powerful." I loved seeing all the faces and hearing the voices of all those who knew Abby as a Planned Parenthood director, and who now know Abby as a former Planned Parenthood employee. 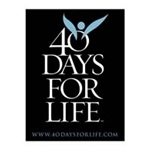 One person that was interviewed in the documentary was Shawn Carney, Campaign Director of 40 Days for Life. Shawn and his fellow prayer warriors peacefully stood outside the fence that surrounded the Planned Parenthood clinic in Bryan College Station, TX and prayed for Abby and all Planned Parenthood workers. Throughout the documentary, Abby's parents are interviewed. It was heart-wrenching to see the pain on their faces. Abby's parents recount how torn and confused they felt when they heard the news that Abby accepted a full time position at Planned Parenthood and when the truths of Abby's past came into light. Abby's parents and her husband, then boyfriend, did not agree with Abby's decision to work at Planned Parenthood. The documentary does an excellent job showing that even though Abby's loved ones disagreed with her career choices, they still loved her unconditionally and were always available to listen to Abby. This was one of many life lessons that my husband and I took away from watching this DVD, to continue to love and pray for those in our lives that make poor or immoral choices. My husband and I highly recommend everyone view this documentary as Abby's story and the lessons she learned can teach others in so many ways. We thought the DVD was done very professionally and the ending was inspiring and uplifting! 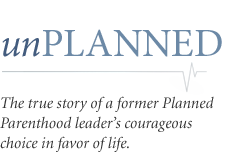 The Unplanned DVD also includes Extra features including information about Heartlink, The Ginger Millermon Story, information to order the book, Unplanned, and Printable PDFs that can be printed and used by churches and small groups. My husband and I enjoyed viewing the Extra features also. You can have a chance to purchase the book and/or DVD at the Unite for LIFE webcast. This is a free webcast featuring Abby Johnson that will benefit pregnancy care organizations. You can sign up to participate on May 17 at 8:00 p.m. (in all time zones) at Unite for Life. Unplanned the book and the DVD will be available for purchase as a package deal and 33% of each purchase will go to crisis pregnancy centers like CareNet, the National Institute of Family & Life Advocates, and Heartbeat International. You can find Abby Johnson now working for the culture of life with many pro-life groups such as LIVE ACTION and she speaks all over the country on how her life was changed with love and prayer. "The Lord has done great things for us and we are filled with joy." Besides the review copy of the Unplanned DVD, I also received a certificate from Tyndale House Publishers to award one lucky winner a copy of the Unplanned DVD! Just add your name and email to the InLinkz below. The giveaway is open to all, even those who don't have a blog, so it is not mandatory to include your URL. You may only enter once. Your entry must have your email address included. If its not in your entry, and you’re the lucky winner, a new winner will be chosen. This giveaway ends 5/10/2011 at 9pm EST – all entries must be in before. If you are the lucky winner, you have 48 hours to respond to my email. A new winner will be chosen if we do not hear back from you within that 48 hours. Winner will be announced on A Slice of Smith Life 5/11/2011. Thanks so much to Tyndale for providing the review and giveaway copies of the DVD and inviting me to help promote the culture of life and the Unite for LIFE webcast! Please join Lynda (Did you know Lynda is hosting a great giveaway now also? ), Anna-Marie, and myself at No Ordinary Blog Hop (NOBH). Click button below for details and to read some great blog posts that have already linked up! 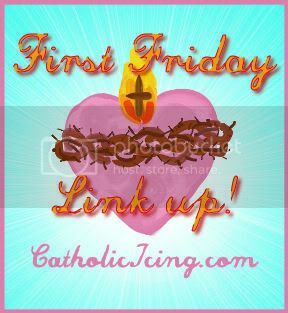 I'm also linking this post to Catholic Icing First Friday Link Up. Just found the No Ordinary Blog HOp and I love love love the concept! LOVE IT! Swinging by to say hi and follow so I don't miss any of the good stuff. this documentary sounds amazing! Following you now from the No Ordinary blog hop! The book/video above look interesting! Hi Tracy! How amazing that you were able to review the Unplanned DVD. I just told myself the other day that I need to pick up the book. It sounds like such a great story. I have really enjoyed reading your review! Thank you so much for your review, now I need to get out there and get the book as well as the movie. Have a wonderful day! P.S. my husband would prefer the movie as well! Hi Tracy, that is so great that you were given the opportunity to view the DVD and offer one for a giveaway. I read the book and couldn't put it down. I has inspired me to reach out to my local pro-life group and just this morning I went to an abortion clinic in my town and prayed outside it with my son. Thank you for spreading the word of the truth behind Planned Parenthood. So glad you came by for a visit here from NOBH! I'm following your blog now after I just stopped by and left a comment on your current post :) Have a great weekend! Thanks for the votes :) and for sharing my giveaway on your posts! Have a blessed day! I hope you get a chance to read the book and view the DVD. I think the book/video can teach everyone something, no matter what our views are on PP and abortion. Have a blessed day and thanks for entering giveaway! That is so wonderful that you were able to reach out to your local pro-life group and pray at the abortion clinic. You know, Johnson's book and DVD has inspired me to make more of an effort to pray for the unborn and their mothers outside abortion clinics too! God bless and thank you for entering the giveaway! HaPpy to see there's a dvd! thx for this opp.. Thanks for entering giveaway! Good Luck and if you even if you don't win the DVD with my giveaway, I hope you will have an opportunity to view it sometime! It's worth it to hear Abby's story! Wow, I would love to win this DVD. I have heard a lot about Abby from others and it would be good to watch. So glad you entered! Good luck in the giveaway and I hope you get to view the DVD sometime whether you win or not!